Discover all our jewelry collection ephemeral real 24k gold! 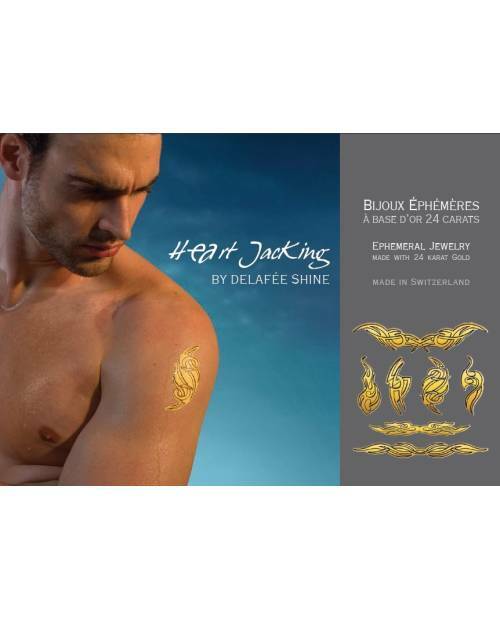 Heart jacking, in partnership with DeLafée, offers a collection of temporary tattoos, based on the same principle as the decal. Made of 24 carat gold, these jewels ephemeral arise easily and are water resistant. A cosmetic luxury! These ephemeral jewels of extreme delicacy harmoniously follow all the contours and movements of your skin. Here is an exclusive global ephemeral jewelry 24k gold.